The Florida Supreme Court Judicial Nominating Commission, which met in a closed-door session in Orlando, advanced a list that includes seven appellate court judges, two trial court judges and two other lawyers. DeSantis will pick from the list to replace justices Barbara Pariente, R. Fred Lewis and Peggy Quince, who are leaving the court in January because they have reached a mandatory retirement age. Their terms end on Jan. 8, the day DeSantis takes office. In his campaign, DeSantis, a former congressman and Harvard Law graduate, said he would appoint “solid constitutionalists” and end “judicial activism” on the seven-member court. In a statement on Tuesday, DeSantis called the nominees a group of “talented and highly qualified individuals.” He said he wanted to continue outgoing Gov. Rick Scott’s “outstanding legacy” of judicial appointments. “I look forward to his counsel as I work to evaluate each nominee to ensure that the next three justices appointed to the Florida Supreme Court will respect our Constitution and the rule of law and serve our state with distinction,” DeSantis said. The nominees, who were selected from among 59 applicants, represent a group of conservative judges and lawyers. All of the appellate judges were appointed by Republicans, including five appointed by Scott and two appointed by former Gov. Jeb Bush and former Gov. Charlie Crist. Scott appointed one of the two trial judges on the list. In terms of diversity, two of the nominees are women, while the only two women currently on the court, Pariente and Quince, are retiring. Two nominees identified themselves as Hispanic and one as an Asian-American. There are no African-American nominees, meaning Florida’s highest court will not have any black justices after the retirement of Quince. The group of nominees is relatively young, with an average age of just under 46. The ages range from 37 to 54, according to the nominees’ applications. The ages are significant with the passage of a new constitutional amendment that raises the mandatory retirement age for judges from 70 to 75 years. It means if DeSantis picks any of the three nominees under the age of 40, they potentially could serve as justices for more than 35 years. DeSantis’ appointments are likely to represent a long-term shift in the ideological balance of the court, where Pariente, Lewis and Quince are part of a liberal bloc. They have often been joined by Justice Jorge Labarga, who will remain on the court. —Circuit Judge Bruce Kyle, 49, of Lee County. Kyle served four terms as a Republican lawmaker in the state House before winning election to the trial court in 2006. — Carlos G. Muniz, 49, who was appointed as U.S. Department of Education general counsel by President Donald Trump. Muniz also served as a deputy attorney general and chief of staff to Attorney General Pam Bondi. He worked as a lawyer and deputy chief of staff in the Florida House and as a deputy general counsel to Bush. — Jonathan Gerber, 50, chief judge on the West Palm Beach-based 4th District Court of Appeal. He is also a former circuit and county judge. — Jamie Rutland Grosshans, 39, a judge on the Daytona Beach-based 5th District Court of Appeal. She is a former assistant state attorney and county judge. — Jeffrey T. Kuntz, 37, a judge on the West Palm Beach-based 4th District Court of Appeal. — Timothy Osterhaus, 47, a judge on the Tallahassee-based 1st District Court of Appeal. He is also a former solicitor general in Bondi’s office. — Samuel Salario, 47, a judge on the Lakeland-based 2nd District Court of Appeal. — Anuraag Singhal, 54, a circuit judge in Broward County. — John D. Couriel, 40, a partner in the law firm of Kobre & Kim in Miami. He is a former federal prosecutor. — Barbara Lagoa, 50, chief judge-elect on the Miami-based 3rd District Court of Appeal. She is a former federal prosecutor. — Robert J. Luck, 39, a judge on the Miami-based 3rd District Court of Appeal. He is a former circuit judge and federal prosecutor. 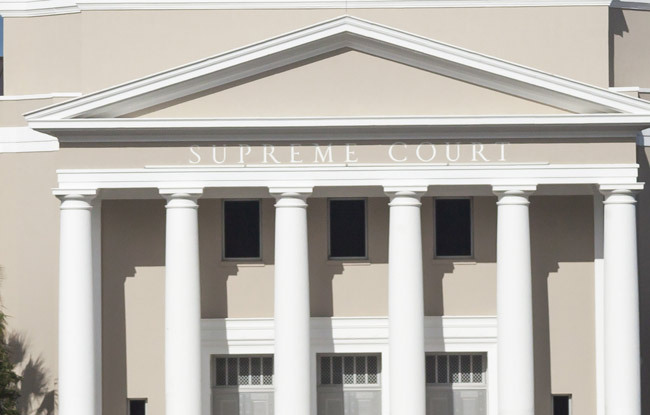 The nominating commission indicated that Couriel, Lagoa and Luck live in the 3rd appellate district, where one of the three new justices must reside. The other two appointments are for at-large positions on the Supreme Court. Please no one from crooked Broward County. When these corporate tools appear on future ballots – vote to NOT retain them. Vote Blue as if your life, health, and future depend upon it. They do. Yes, look what a “Blue” Person wishes on a fellow persons family. Think before you speak, Blue. Think before you vote Blue. They do not care about your health, life or your welfare. A Democrat lawmaker is facing backlash for verbally attacking a GOP colleague and his family during a debate in the Illinois House of Representatives. The incident happened this week as the officials were discussing legislation centered around a deadly outbreak of Legionnaire’s disease at a veteran’s home run by the state. Republican Peter Breen was wondering about the potential cost of the measure, which would increase the potential monetary damages awarded in civil lawsuits. Democrat Stephanie Kifowit responded with a heated comment a few minutes later. “To the representative from Lombard, I would like to make him a broth and pump it into the water system of his loved ones, so that they can be infected, they can be mistreated, they can sit and suffer and get aspirin instead of being properly treated, and ultimately DIE,” she stated. Hey Pogo – please cite for us one or more rulings by each of the nominees that will prove they are corporate tools. We’ll wait. . . .